The National Football League Pro Bowl used to mean something, used to be a point of pride, used to be an opportunity among the men fortunate enough to play in it to find out just how good they truly were. The semi-touch-football, non-competitive, run-around-for-a-while television filler it has become would truly embarrass players from past eras. With twelve teams comprised of roster sizes that ranged from thirty to thirty-three to thirty-eight players from the Pro Bowl’s inception following the 1950 season, until NFL expansion for the 1960 season, and then limited to forty through the mid Sixties to mid Seventies, it was an ongoing, season-long contest to survive. Demonstrating the ability to make a roster and then be chosen as one of the best of the best with a Pro Bowl invitation provided a showcase for exceptional ability. The addition of the American Football League which had its own All Star Game also separated superior players from those already considered to be truly skilled and it “meant something” to earn the Pro Bowl or All Star distinction. In any season consisting of twelve games and even with an increase to fourteen, many teams would not face off against each other, and the Pro Bowl allowed the best offensive players to go head-to-head against the best defensive players from the other conference with individual match-ups that otherwise weren’t seen during the regular season. The Pro Bowl was an opportunity to prove one was the best against those with equal reputations and it was played that way. After the NFL – AFL merger of 1970, the Pro Bowl squads were divided and played as the National Football Conference versus the American Football Conference with all of the pent-up and reserved hostility that the leagues held towards each other for the preceding decade. It was, for long-time AFL players, an opportunity to show their wares and obviate their perceived slight by the senior league. It was a chance for the NFL players to maintain a public perception of superiority and those early games were played with a level of fierceness often reserved for crosstown high school rivalries. 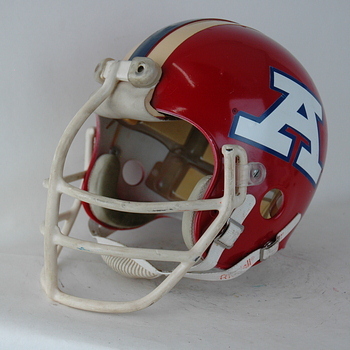 The AFC – NFC headgear worn for the 1970 through ’77 post-season games featured the “A” or “N” of one’s representative conference with each player’s helmet painted and properly prepared prior to the game. 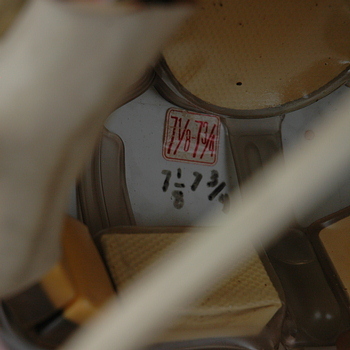 These simple but beautiful helmet designs “said it all” as one side slugged it out with the other. One of the men whose entire ten year career proved he was among the best, reflected in his season-to-season performances and his seven Pro Bowl selections was Randy Gradishar. He was an outstanding football and basketball player at Champion High School in northeastern Ohio, and a two-time Consensus All American linebacker and Academic All American at Ohio State. Woody Hayes gave him the signular honor of stating that he “was the best linebacker I ever coached.” As the Denver Broncos first round draft choice in 1974 he continued to shine, starting his career as their outside linebacker before moving to the middle and being named to the Pro Bowl in only his second season. The Broncos were no more than a long-suffering mediocre franchise that featured a few true stars like Floyd Little but Gradishar’s performances were coincidental to a steady elevation in play that led to a 9 – 5 record in ’76 and 1977’s first entry into post-season play and a Super Bowl appearance against the Dallas Cowboys. 1978’s NFL Defensive Player Of The Year spearheaded a defense that carried the team through further successful seasons, other than 1982’s strike- shortened year, until his retirement following the ’83 season. 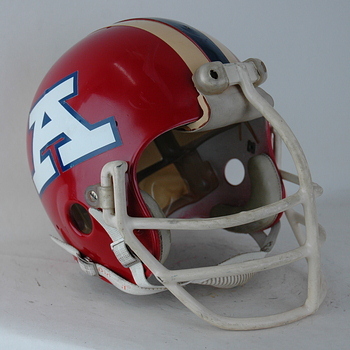 When the Pro Bowl began it was customary for players to bring their own helmets to the game in Los Angeles and have them painted in either royal blue if representing the NFL Western Conference or red if from the East. Appropriate matching jerseys and pants would complete the uniforms and the distinctive look made it clear which side was being represented. 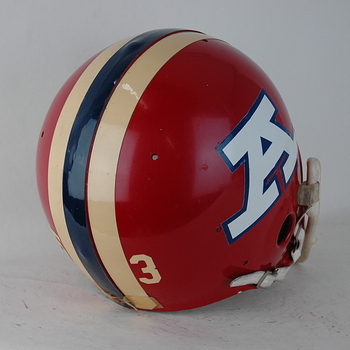 The Pro Bowls following the 1965 through ’68 seasons saw the use of gold helmets with the NFL shield decal on each side for both teams, the distinguishing feature being the blue or red flanking stripes with the display of the NFL 50th Anniversary logo shield utilized for the game after the ’69 season. After the merger, the American Conference was designated as the “red side” and the NFC the blue. Gradishar, a proud member of his first Pro Bowl squad after his sophomore season and again in ’77 as the first two of seven such awards, was among but a few, at least in the game following his outstanding First Team All Pro season in ’77 who brought his personal helmet to the bowl site with him but did not wear it for the game. This beautiful piece of Pro Bowl history is dated as a brand new Riddell HA-91 helmet manufactured in 1976 that was afixed with Gradishar’s distinctive Riddell mask that he wore for a few seasons. 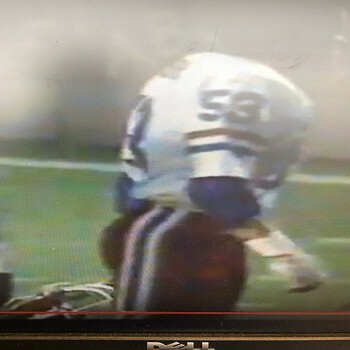 His Broncos blue helmet was not used in this Pro Bowl game as this specific game worn helmet demonstrates an absence of having ever been blue and was manufactured as a red helmet, presumably becoming part of the equipment reserved only for the Pro Bowl. Gradishar’s mask of course stood out. 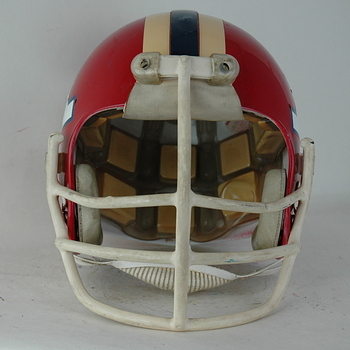 Taken from his ’77 in-season helmet and utilized for the Pro Bowl, it has remained on this terrific personal treasure as he utilized a new style mask for 1978. 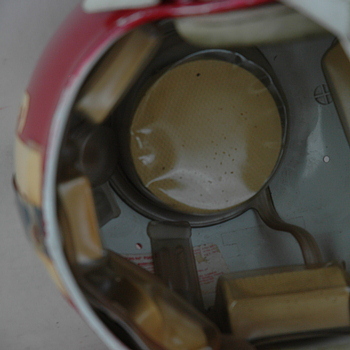 The mid-1970s Riddell mask that is so distinctive with it’s bend and attachment to the helmet was a copy of the Dungard mask but as helmet fans know, the Riddell units were rubber-dipped steel and obviously much heavier than their Dungard aluminum counterparts which immediately explains their brief term of use. 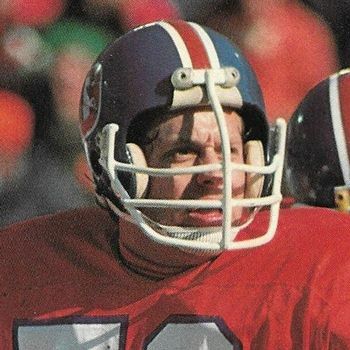 Unlike typical Pro Bowl helmets, Gradishar’s 1978 game worn headgear ensemble was distinguished by the fact that the helmet was new for this game and featured a limited and briefly used mask, one that certainly was immediately identifiable. This very much describes Randy Gradishar, a unique player of immense determination and ability who also stood out during a highly awarded and distinguished ten year career.